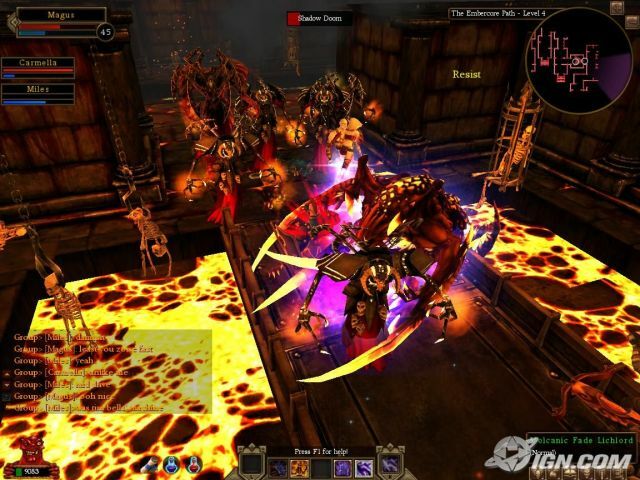 Dungeon Runners is an MMORPG (Massively-Multiplayer Online Role-Playing Game) influenced by Blizzard's popular World of Warcraft and Diablo games, as well as a little bit by NCsoft's own Guild Wars. However, this isn't a game that takes itself seriously, but rather seems to be a parody of this genre of game. This game can only be played online, although you can still do it solo if you want, but unlike most other MMOs you can play this one for free. Guild Wars didn't charge you to play online, but you still had to buy Guild Wars, but even the Dungeon Runners game itself is absolutely free. However, you can buy a box version of the game for chump change, which enables a few little extra perks for you in the game. Players can also choose to pay $5 a month for an upgraded play experience. Some of the game's better items can only be used by "members", which are of course the folks that payed. Secondly, players that paid get a lot of extra storage space at the in-game bank, which serves as a storage vault, which is nice for when you start stockpiling equipment that you aren't yet capable of using. Third, players buying the retail game get a "bling gnome" which goes around collecting your loot for you. Fourthly, paying players can use voice chat, rather than being entirely limited to text chat. I'm not sure what all differences are to be found by paying a little bit for playing this game, but during my free play I constantly observed advertisement banners running along the entire top of the screen. That's of course completely reasonable on account of us not being charged to play the game, but I cannot say whether or not the ad is still there even if you did pay. They also throw in some full-screen ads during transition/load screens. One plus side to playing Dungeon Runners is that players can choose between a handful of "realms" to play in, each indicating how many players are in there before you select one. In World of Warcraft, you are bound to a particular realm, although there are reasons for that. This means that DR players can choose either a high-traffic realm if they want to guarantee that there are plenty of players to party with or maybe trade with, or players can choose a lower-traffic realm if they are afraid of lag or hate chat SPAM. Jumping right into the game, World of Warcraft inspirations are obvious, not only from the art style and character designs but also from the presentation of the menus, especially the quest menu. Equipment, however, is more inspired by Diablo, including parodying the naming of the items. In Diablo, crappy items might be prefixed by something like "tattered" or "crude", and Dungeon Runners throws "cardboard" items at you early on. Then when you get to better items in Diablo, they have tiers of special names like "King's Sword of Vampires" or "Godly Plate of the Whale", and Dungeon Runners mockingly does something similar, but more laughable, with equipment like "Celestial Rusty Ornate Gauntlets of the Inviolable Liger", "Baptismal Rusty Scale Mail of the Comprehensive Hippo", "Intergalactic Designer Locket of the Sasquatch", or "Gnarly Cardboard Twisted Cane of the Beaver". The quests aren't any more serious, often with lists of ridiculous things to fetch and with quest descriptions consisting of large volumes of mindless ranting to wade through just to find what you actually need t do. The voice acting is much the same, with characters speaking mockingly in archaic lingo and sometimes making fun of medieval stuff or aspects of MMORPGs in general. I've also encountered characters that do poor impressions of real-world people like Arnold Schwarzenegger and Sean Connery. The Schwarzenegger impersonator makes a comment that when sleeping people call him "The Hybernator", obviously a parody of The Terminator. The Connery impersonation speaks of having a tankard of ale and "a license to spill", again an obvious parody of James Bond's "license to kill". Where the game reminds me of NCsoft's own Guild Wars is in the instancing of the game environments. 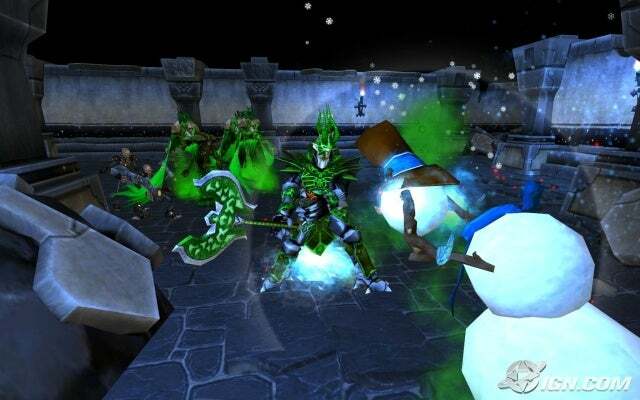 The game is played online with other players, but players do not have to actually share the dungeons with other players. They can see the chatter over the game's channels and participate therein, and they can encounter players in town, but when they venture out of town into the dungeon areas they enjoy their own private instance of that outside world, unless they should be in a party with which they would be venturing out together with them and only them sharing that game environment. The good thing about this is that players do not have to suffer having all the enemies slain by other players. Unlike Guild Wars, those instanced environments are fairly small by comparison and a lot less detailed. In the end, the game is shallow and a blatant parody of other MMOs and Diablo, but it's free and still enjoyable enough to anybody that can enjoy something like World of Warcraft, Diablo, or Guild Wars. The visual style of the game largely resembles World of Warcraft. Unfortunately, it still falls short of WoW and for a 2007 release it is less than stunning. However, the lower graphic detail makes for a game that runs smoothly even on lesser computers. The music gets the job done but is still forgettable and sounds a lot like a midi. The voice acting is cheesy, but I think it is deliberately so. The game doesn't take itself seriously at all, and the voice acting plays along with this. The game doesn't try very hard at anything. 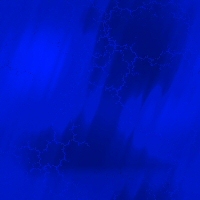 Everything is straight-forward and basic with no flash to be found. It's also full of advertisements, though that's to be expected of a game like this that's given to you 100% free. Gameplay is a blend of World of Warcraft, Diablo, and NCsoft's own Guild Wars, and a pretty basic blend. It isn't doing anything we haven't all done in several other MMOs. Still, it's entertaining enough, but just won't be winning any awards or praise for anything. If you like Diablo or WoW, you'll probably get some entertainment out of Dungeon Runners. Not bad. It's no Diablo or World of Warcraft, but it is mildly entertaining and it's a completely free MMO so anybody liking these things will probably get some satisfaction out of Dungeon Runners. Otherwise, just pass on it. so it like WOW but lamer right? I got bored with this after like half a hour. Good review as always Iceman. Keep them coming!